Share this product and receive a $6.59 sharing discount. This piece is a combination of fine art and a meaningful message! It has been framed with double matting and glass. 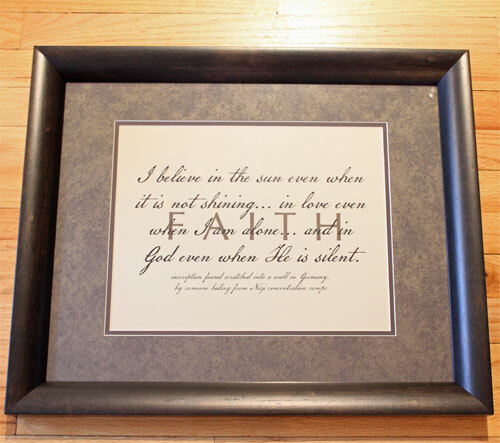 I believe in the sun even when it is not shining; In love even when I am alone, And in God even when He is silent... inscription found scratched into a wall in Germany by someone hiding from Nazi Concentraion Camps. 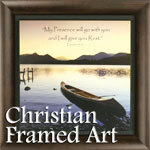 Made with a solid wood espresso-colored frame that measures 23" x 19". The matting is linen with chocolate metallic. Ready to hang...includes two hangers on the back corners and a wire. Amazing quality ... certain to be treasured for many years to come.